Born on April 15, 1919, at Lyallpur, now in Pakistan, MIAF Arjan Singh DFC was the first and only "Five Star" rank officer of IAF. His father, grandfather and great grandfather had served in the British Indian Army. New Delhi: The birth centenary of the legendary Marshal of the Indian Air Force (MIAF) Arjan Singh, is being celebrated today. Arjan Singh is remembered for his distinguished service in commanding the IAF during the 1965 Indo-Pak war will continue to inspire the generations to come. Born on April 15, 1919, at Lyallpur, now in Pakistan, MIAF Arjan Singh DFC was the first and only "Five Star" rank officer of IAF. His father, grandfather and great grandfather had served in the British Indian Army. His dynamic personality and professional competence set him apart as a leader and an icon of the IAF. Singh was the chief of the Air Staff (CAS), from 1 August 1964 to 15 July 1969, and was awarded the Padma Vibhushan in 1965. When appointed as IAF's chief of the Air Staff, he was just about 45. He has been the only chief of the Air Staff to have headed the Air Force for five years as opposed to the regular tenure of two and a half to three years. Singh also became the first chief of the Air Staff of the IAF to be upgraded to the rank of Air Chief Marshal from the rank of Air Marshal in honour of his Air Force's contribution in the 1965 war. He retired in 1969 at the age of 50. 2. He was commissioned as a pilot at the age of 19 at the RAF College Cranwell in 1938. He was an ace swimmer and held an all-India record in freestyle swimming in one mile and half mile events. At RAF Cranwell, He topped the course among his batch of Indian Cadets. He was the vice-captain of swimming, athletics and hockey teams during his training. 3. In the year 1944, Singh led a squadron against the Japanese during Arakan campaign and later, even assisted the advance of the allied forces to Yangon. In recognition of his feat, the Supreme Allied Commander of South East Asia awarded the Distinguished Flying Cross (DFC) to Singh, who became the first Indian pilot to receive it. 4. On 15 August 1947, he achieved the unique honour of leading a fly-past of over a hundred IAF aircraft in Delhi, over the Red Fort. After his promotion to the rank of Wing Commander, he attended the Royal Staff College at UK. Immediately after Indian independence, he commanded Ambala in the rank of Group Captain. 5. In 1949, he was promoted to the rank of Air Commodore and took over as Air Officer Commanding of an operational command, which later came to be known as Western Air Command. Marshal of the Air Force Arjan Singh, had the distinction of having the longest tenure as the AOC of an operational base, initially from 1949-1952 and then again from 1957-1961. 6. During the 1965 war, the Air Force Marshal was the first Indian Air Chief to lead a young IAF into war. He was Chief of the Air Staff when the IAF saw action in 1965. He was hardly 44 years of age when entrusted with the responsibility of leading the IAF. At five years, his tenure as the CAS was the longest as opposed to the usual two to three years. He retired at the age of 50. 7. He has flown over 60 different types of aircraft from Pre-WW-II era biplanes to the more contemporary, Gnats & Vampires, he has also flown in transport aircraft like the Super Constellation. 8. The Marshal was awarded the Padma Vibhushan for his astute leadership of the Air Force during the war. 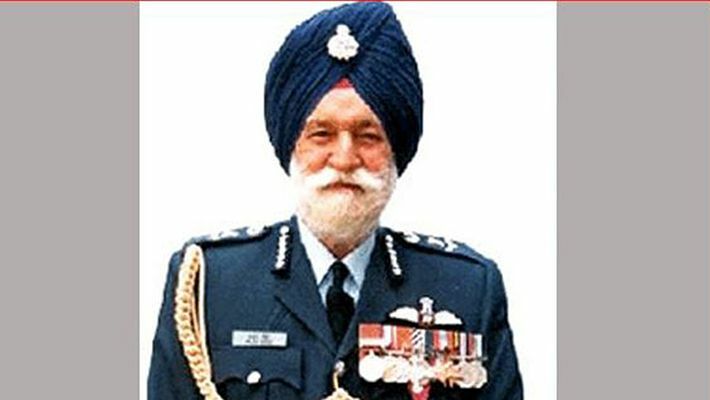 Subsequently in recognition of the Air Force's contribution during the war, the rank of the CAS was upgraded and Arjan Singh became the first Air Chief Marshal of the IAF. He remained a flyer to the end of his tenure in the IAF, visiting forward Bases and units and flying with the Squadrons. 10. After retirement, he continued to represent the nation as the ambassador to Switzerland and as High Commissioner to Kenya. He even served as Lt. Governor of Delhi. It was only in 2002 that the government decided to confer on him the rank of ‘Marshal of the IAF’ for his lifelong service to the force and the nation. On the occasion of his 97th birthday in 2016, the airbase at Panagarh was renamed after him. A rare honour and the first of its kind for the IAF.